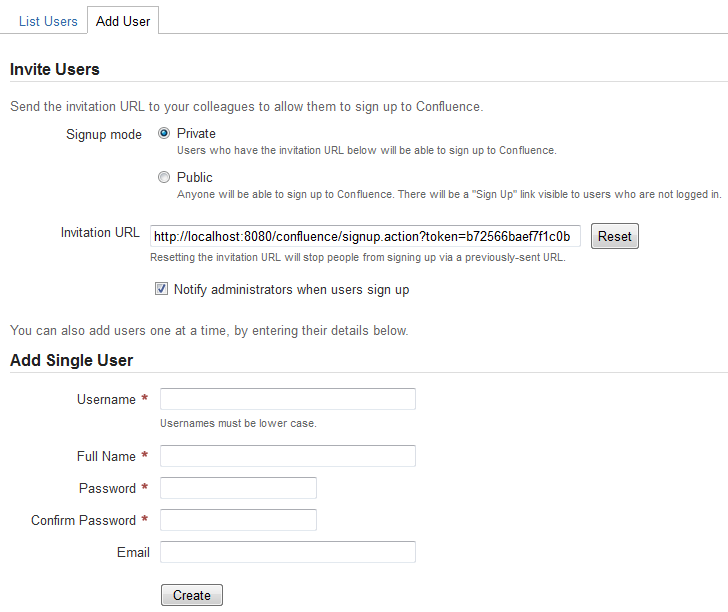 The Atlassian Confluence team is pleased to announce the release of Confluence 4.1.9. This release includes the new invitation URL, providing a quick and easy way of inviting people to sign up to Confluence. We have also fixed some bugs. Note: Confluence 4.1.8 was an internal release, not available publicly. Take a look at the new features and other highlights in the Confluence 4.1 Release Notes. It's what you have been dreaming of: a quick and easy way of inviting people to sign up to Confluence. Just send them a URL. You can also choose between public and private signup modes, and decide whether you want a notification each time someone signs up. See the documentation. Inviting users and setting the signup mode. Upgrading from a previous version of Confluence should be fairly straightforward. Please read the Confluence 4.1.9 Upgrade Notes. We strongly recommend that you back up your confluence.home directory and database before upgrading.